And now for something completely different. Glasses. 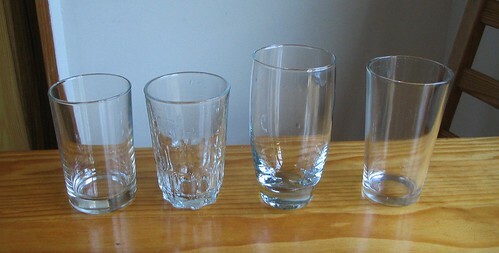 I’ve got a few different types of glasses in my kitchen, many of them remnants from previous collections. (1) These used to come as IXL jam jars. You’d use up the jam, dispose of the label and the lid, and get to keep the jar as a glass. Given that was a good 11-12 years ago, I’m amazed they’ve lasted this long, though I only have a couple of them left. (2) When I first moved out on my own in 2000, I bought a pack of The Price Brand (eg the cheapie brand) glasses at K-Mart. This is the very last of them that has survived. (3) This one is tall and fat in the middle, and is one of a pair left behind by Iris when she went home to Israel back in early 2001. (A colander, a dish rack, some mugs and some plates were also part of that collection. She chose well; they’re all still in use.) These glasses have got a heavy base, which means they’re quite top-heavy when placed into the dishwasher upside-down. (4) I’ve got a bunch of these ones. This glass shape is my preference for new purchases, because it’s tall (but not too tall) and narrow, it makes the best use of space in the dishwasher. Like my strategic purchase of more cutlery, this helps ensure I don’t have to run it more than every 2-3 days. yep, “re-use” is even better than “re-cycle”. Good one! We’ve got three IXL jam jar cups left, but not as clear as yours – very cloudly these days from being abused by the dishwasher! We’ve got a hodge-podge of glasses as well. I like the tall narrow type as they fit the best in the dishwasher. Nice size too for a drink of milk. House has the best glass jars and cups. It’s always the ugly glasses which are indestructable. I have lots of those jam and vegemite glasses, and I am surprised you have so much ease in breaking them, mine don’t break. I keep buying glasses with curved sides like your third example, and they don’t last long at all. I’ve got a ‘manual dishwasher’ – and its the glasses with curved sides that tend to break! Our IXL glasses are cloudy, scratched, battered, but still have a perfect lip after all these years. LoL. I thought only my Mom does that. Use empty jam jars as glasses. HaHa. Good to know other people do it too. @Lyn I find that to be true too sadly. I love my colored-glasses but they break too easily. Boring glasses live longer. @Chelsea, in this case the IXL branded jam jars were specifically designed to be kept as glasses once emptied of jam. I have 15 IXL jam jars, but these are the ones with the pre printed Looney Tunes Collector series on them. Have had them over 15 years and they have been in the dishwasher 100’s times and never lost their images, they look like they are still new.